This is a Text Recipe, not a Video. Due to commitments on home front and paucity of time it is becoming difficult to make videos of all known recipes. If I have to make a video only before I’m to share these recipes, it is likely to take considerable time. Meanwhile there is also an urge to share these recipes for the benefit of my viewers. These recipes are prepared, perfected and tasted at home. Hence they too carry the same commitment and conviction as in videos, while I share them with you. As and when these text recipes are converted into videos, the above photograph would be replaced with its video. Enjoy!!! Add citric acid in water and mix and keep it aside. Grease with ghee (liberally) a bowl or a bread loaf tin which is rectangular in size. For convenience sake line the tin with a parchment paper and grease with ghee liberally---it would be easy to remove the set kalakhand from tin when we use parchment paper. When milk thickens, add cream and mix. Now to the milk add water in which citric acid is added. After adding citric acid mixed water, do not stir the mixture for 15 seconds---this allows the milk to curdle in tiny bits. Then cook milk stirring continuously for 3 to 4 minutes or till the mixture thickens. Then transfer the pan to small burner and cook on high flame. Add sugar and cook stirring till sugar dissolves for 12 to 13 minutes. 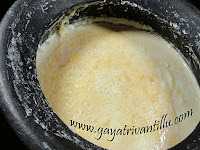 There should not be any moisture left in the milk mixture and ghee should separate---till that time cook. 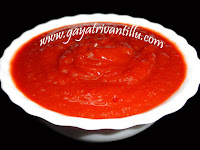 The mixture should get fried in ghee and then it changes color slightly. Transfer the prepared kalakhand into the prepared greased tin and cover lightly (not with a tight lid) and allow to cool completely. Once cooled fully, transfer the kalakhand into a plate and cut into pieces using a serrated knife to get neat finish pieces. Observe that it is creamy or light yellow in color on top and bottom and the middle portion would be slightly brown in color. Due to the heat trapped inside the middle portion gets cooked further and caramelizes and gets a deep color. Serve this tasty ajmeri kalakhand as it is or garnish with few chopped pistachios. Preferably use a nonstick pan as it reduces the job of scraping the solidified milk on the sides of the pan while making this recipe. Use two nonstick pans and distribute the milk in both the pans and cook so that it speeds up the process of reducing milk. Once the milk starts to thicken transfer the milk into one pan and then continue the remaining process. Here I have used no fat milk that means entire cream removed from milk. As daily I remove cream from milk I have used this milk and that is the reason I have added cream separately. One may even use full fat milk and avoid adding cream. Do not reduce the sugar quantity---otherwise we do not get the right taste. Also if sufficient sugar is not there the process of caramelizing does not take place and it would be like a normal kalakhand instead of ajmeri kalakhand. One may even add lemon juice instead of citric acid but with citric acid we can specify the amount but with lemon juice one has to be more careful regarding adding the amount of juice. Adding citric acid or lemon juice plays an important role in this recipe. If we add more of citric acid water, milk would curdle like big chunks and if we add less, milk may not curdle properly. So add citric acid mixture little by little and check and then add more if required. Here I have tested this and came with these exact measurement of citric acid and water. So add the mentioned amount in one go and mix and continue the remaining process---no need to add slowly and check. The point is that the milk should curdle into tiny particles but not as big chunks. When milk curdles as tiny particles it appears like reduced milk or mava or khoya. Add citric acid mixture only after milk is reduced and about to become khoya. Cut the kalakhand into pieces and observe that it has multiple colors. As it happens in Mysore Pak, here also due to the heat trapped inside, the curdled mixture cooks further and gets caramelized and hence the middle portion is slightly in deep color when compared to the top and bottom layers.Normal kalakhand would be white in color and this ajmeri kalakhand would be brown in color. For normal kalakhand we curdle the milk in the beginning itself whereas for ajmeri kalakhand we curdle the milk once it is reduced to khoya stage. Reduced milk is curdled that too with less quantity of citric acid mixture so that the milk curdles are tiny and not big. That is the reason there is also a taste and texture difference in both the kalakhands. Use a serrated knife to get neat finish pieces. 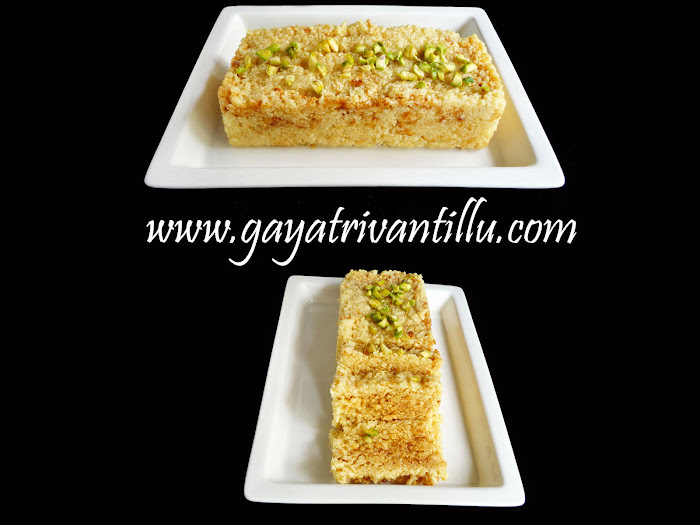 Be very patient and also be attentive while making this sweet recipe. As milk sticks to the bottom of the pan and gets burnt we need to stir continuously. It is a time consuming recipe but worth its taste.